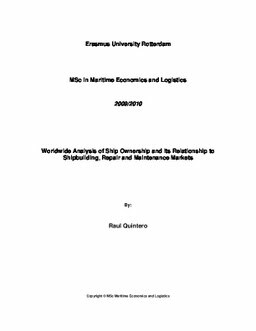 Proposed by Holland Marine Equipment (HME), the following thesis focuses on analyzing worldwide ship ownership and its relations to the ship building and repair markets. This is of most importance to HME so they can position the Dutch equipment and technology sector for shipbuilding and repair in the global market. The industry is showing a greater involvement of Asian shipowners and by identifying the importance of these shipowners and geographic regions, the study will use this information to pinpoint the existence of maritime clusters in the ever growing Asian markets. Maritime clusters gather entities dedicated to maritime services, education or manufacturing so it become a focal point of the research as for the equipment and technology companies‘, that HME represents, depend on exports and cluster dynamics for future growth. Moreover, by benchmarking Asian emerging markets and established European maritime clusters through economic indicators and fiscal climates, the study will recommend which of the Asian countries is best suited for foreign investment and eventual location for HME expansion.